Psst. . . Wake Up . . . Reviewed by Brian McGowan and released by 3MS Music 27 October 2017. 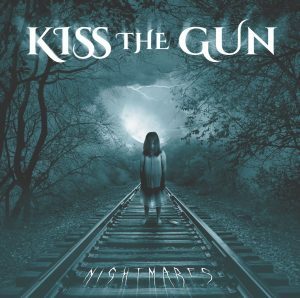 Carefully crafted songs, taut guitars and meaty rhythms form the perfect backdrop for the cool, controlled contralto of female Georgian vocalist, Nadin Zakharian to do the heavy lifting on Nightmares, the debut album from Brit hopefuls, Kiss The Gun. The forensics of Nightmares suggest the band spent their formative years plundering the gene pools of European melodic rock – and maybe a dip of the toe into prog – building their own Rock’n’Roll DNA. So yes, there is a resemblance to the genre’s past glories, but while much of the shape and many of the moves are instantly familiar, there’s enough new blood coursing through Nightmare‘s veins to make it sound remarkably fresh and new. Openers, ‘Into The Fire’ and ‘This Is The Time’ are agile, artful and assured melodic rock songs, driven by chugging riffs and hooky, spooky keyboard motifs, both providing the album with the pace and purpose that often seems to elude fledgling rock bands. Following them with the slowed down tempo of the title track, a song sketched around a classy piano riff, could have lost them all that hard gained momentum. But it doesn’t. Zakharian’s dramatic, stretched out vocal lines raise and lower the temperature at will. Gerry Hearn’s and Graham Exton’s torqued up guitars, and Dave South’s resonating basslines respond accordingly, apparently accepting their place as the backing band to a unique vocal talent. ‘Writing On The Wall’ nods its head to Thin Lizzy’s wiry, surefooted axework and storytelling narratives, and ‘Run Run Run’ and ‘Tainted Heart’, tightly structured songs full of melodic twists, slot their inviting hooks into place with a satisfying thump. The album closes with ‘From The Night’, and again Zakharian’s powerfully provocative vocals are centre stage, fronting a melodic rock guitar, bass and drum ensemble that assiduously manages to avoid genre cliches, at the same time sounding as if it has a signed personal copy of the blueprint.